Congratulations to ISTP middle school students Derrin W., Maia C., Elizabeth M., Cassandre C., Seena S., Chloe M., and Lev S. on having their self-created video, "Foreign Language News" place 2nd in the ACTFL video contest, in the middle school category. ISTP teacher, Jin Huo, was notified by ACTFL with an email stating, "we appreciate your support for our national public awareness effort to bring much needed attention to the important role that language learning can play in the life of a student." 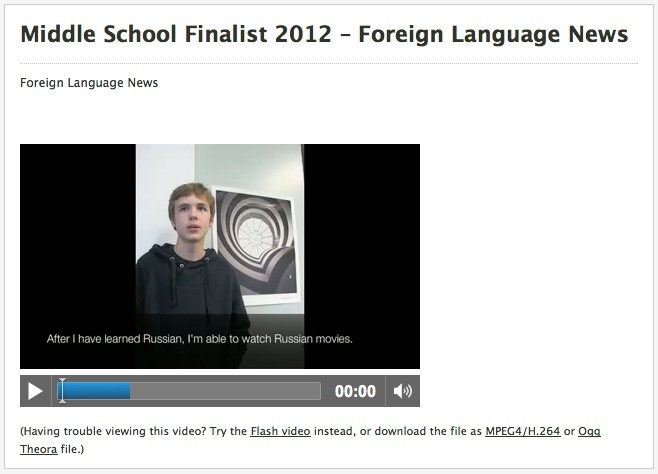 Click here to view "Foreign Language News", or our other ACTFL finalist video, "Become Bilingual", created by ISTP students Matthew P., and Gavin T.